Every year, Pantone selects a Color of the Year. This is the color that’s supposed to dominate the hottest trends for fashion, home décor, and graphic design. And the chosen shade for 2018 is Ultra Violet! I love purple, so I’ll be keeping an eye out for it whenever I’m out shooting. Recently, I set up a simple Ultra Violet photo-shoot so I could quickly add some Ultra Violet to my stock portfolios. 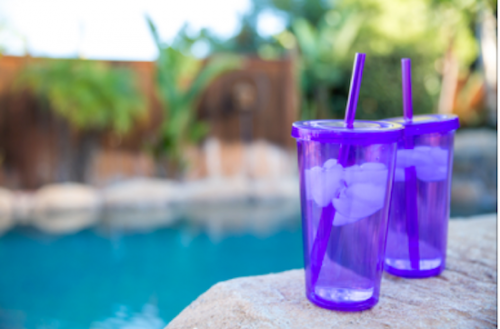 I took a couple of Ultra Violet glasses and set them up by my swimming pool. I think the glasses and the aquamarine of the pool make for a great color combo. Although it’s still winter, editors are already looking for images for spring and summer. 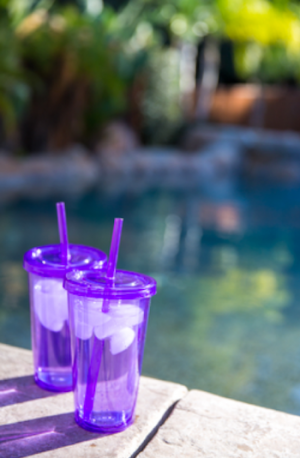 So when you’re setting up some Ultra Violet shots for stock, make sure that they’re bright and evocative of warm weather. Also be certain to take both horizontal and vertical images of the same subject so that you’ll have stock photographs to suit different needs. You might also want to have some fun and play with a purple filter while editing your stock photos. 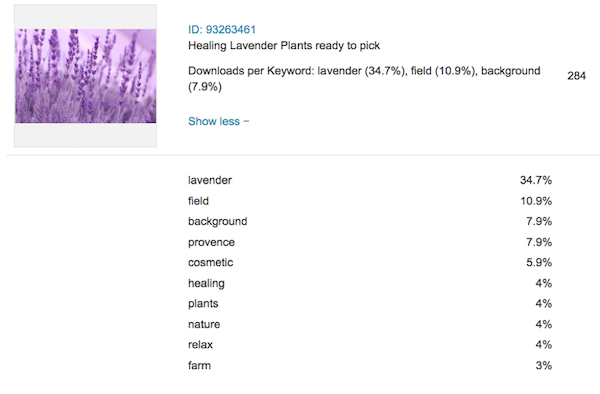 Several years back, I captured two images of the lavender I was growing and uploaded them to Shutterstock. I decided to take a risk and added a creative purple filter to one of the shots (on the left). Guess what—that photo has sold 10 times more than the one without the filter (on the right)! Stock agencies encourage photographers to add color names to their keywords. When I originally uploaded these photos, Ultra Violet wasn’t a trend yet. However, I did use “lavender” as a keyword, since it’s the name of both the color and the plant that I was shooting. As you can see from the screenshot below, “lavender” has been the keyword responsible for nearly 35% of my photo’s sales on Shutterstock. It has sold more than 284 times—it even sold today! So, if you’re going to be shooting color-oriented stock, make sure that you list the color name as a keyword. Since “lavender” has served me so well as a keyword, I’m definitely going to be labeling some photos as “Ultra Violet” this year. Now that I’ve put you in a purple mood, look for this dynamic color and shoot.